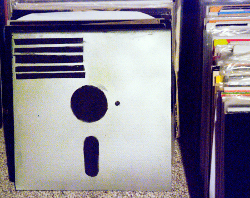 floppy disk stencil on record sleeve by michelle harris. thanks michelle! we are having some trouble with the equipment; a piece has come unfastened somewhere. we are tracing the edges of the chassis and feeling for the muffled thud of an unhooked flywheel extender batting against the interior. but the inner symptoms of this lemon machine are too delicate for our fingers. these instruments are too coarse for this job. well, we'll just have to open the fucker up.